In the annals of seafaring and exploration, there is one name that immediately evokes visions of the open ocean, billowing sails, visiting strange, exotic lands previously uncharted, and civilizations never before encountered-Captain James Cook. This is the true story of a legendary man and explorer. 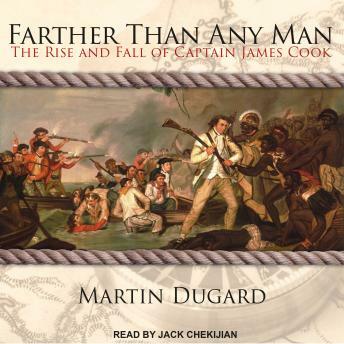 Noted modern-day adventurer Martin Dugard, using James Cook's personal journals, strips away the myths surrounding Cook's life and portrays his tremendous ambition, intellect, and sheer hardheadedness to rise through the ranks of the Royal Navy-and by his courageous exploits become one of the most enduring figures in naval history. Full of realistic action, lush descriptions of places and events, and fascinating historical characters such as King George III and the soon-to-be-notorious Master William Bligh, Dugard's gripping account of the life and death of Captain James Cook is a thrilling story of a discoverer hell-bent on going farther than any man.